It's beginning to feel like- well Spring! This past weekend's activities brought thoughts of warmer weather. Taking walks outside instead of using my treadmill. Grilling Chicken outdoors for dinner. And- the first sign of color in our yard! 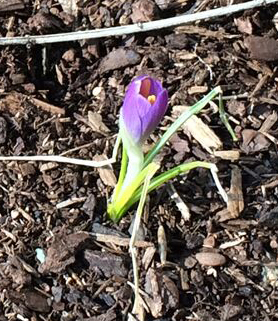 A Crocus is blossoming today! Sweet little messages on paper delivered on or before Valentine's Day have been exchanged for a quite a while! Now, we can create our own cards with messages written by hand or with the aid of a computer/ printer or we purchase commercial cards in stores. Have you ever been curious about when cards for this special occasion were available for sale in the United States? As so many of you know, I enjoy learning about history. Living in Massachusetts I've learned so much about my state's history & also the beginning of our country. Every so often I learn another interesting tidbit about the little things & their beginnings. This is true regarding Valentine's Day cards. Valentine's Day cards were made in Europe. They could be imported to the United States in the 19th century. Esther Howland was a 1847 graduate of Mount Holyoke College in Western Massachusetts. 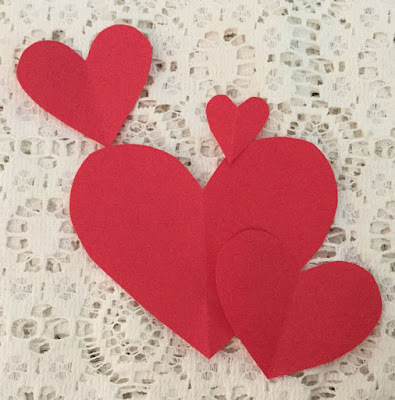 She had received an English Valentine's Day card from a friend & decided to make one herself. Her father was a stationer in Worcester, MA & that helped get her started. Esther was able to have her father import fancy paper to use in making her cards. She hired women to "mass produce" these fancy Valentine's Day cards for this special occasion. She never married, but she successfully ran the New England Valentine Company until she retired. In Grafton, MA, Jotham W. Taft worked for a stationer. While he was in Europe on business for his employer he saw the beautiful ornate Valentine's Day cards that were given to "that special person" on this day. After purchasing supplies in Germany, he returned home. He & his wife went to work making Valentine's Day cards. In 1844 he had a growing business. Women living in Worcester, MA were hired to work in his shop making these cards. "Vintage Valentines" at the Peabody Essex Museum in Salem, MA. Visit "Esther Howland" on the Mount Holyoke College website. And, visit "Valentines" on the Worcester Historical Museum website. Enjoy reading these fascinating stories this weekend! History is interesting! Slow Cooker will be cooking away! It's that time of year! Tomorrow is Super Bowl Sunday! The day when watching the commercials on t.v. & watching the football game are both FuN! And, you just do not wanna' miss the half time show. You get the picture- spending time in the kitchen, cooking? Ah, no! 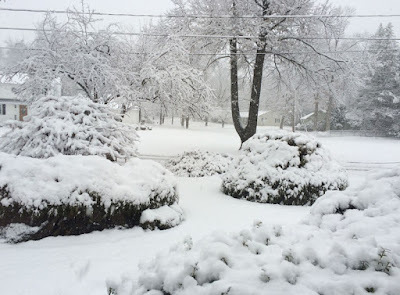 Hey, it's fine to get the dishes & utensils, but just not the day to cook. But you gotta' eat! The choice is not ordering salty "take out" foods, either. Super Bowl Chili is a great choice! In the early afternoon brown the Ground Beef & place it along with the other ingredients in the slow cooker/ crock pot. That small appliance will take care of the cooking detail. 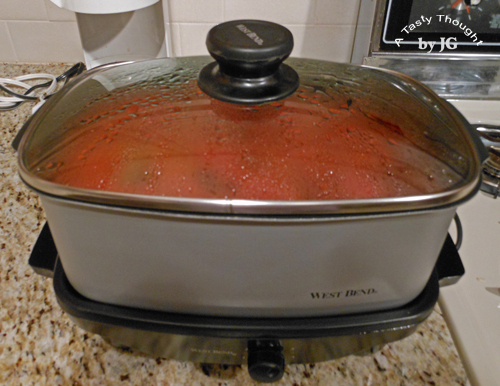 When it's ready, remove the lid, stir the cooked ingredients & take out the serving ladle! The great aroma will invite everyone to take a bowl & fill it. If, there are any remaining portions later, cool & pack in freezer containers. Super Bowl Chili freezes very well, too! Fat Free Sour Cream - Add a dollop on top of Chili in bowl before eating! 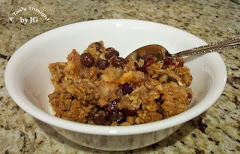 **I brown the Ground Beef before placing in the Slow Cooker's pot to remove the fat. **The Green Pepper cut into chunks is added on the bottom of the pot first to prevent any too crispy Ground Beef. This Chili is incredible! It's so good & it's so easy! A great family style dinner that only needs to be ladled from the cooking pot.